The Crazyflie 2.0 is a nano quadcopter drone kit that is small enough to fit in the palm of your hand yet powerful enough to take your development to new heights. This tiny drone is a flying development platform with a fully open source design. It features a flexible architecture with a dual processor design, a built in 10 DOF IMU, a BLE compatible radio and a lightweight LiPo battery with onboard charger. It is fully programmable and provides a robust hardware expansion connector. The dual processor design uses a powerful microcontroller for the main functions and a separate microcontroller for radio and power management functions. The main processor is a STM32F405 Cortex M4 microcontroller that runs at 168MHz with 1MB of FLASH and 192KB of SRAM. The secondary processor is an nRF51822 Cortex M0 microcontroller that runs at 32MHz with 128KB of FLASH and 16KB of SRAM. The nRF51822 is especially designed to provide both ShockBurst and BLE Bluetooth 4.0 compatible wireless communications. Built in 8KB of EEPROM allows saving various flight configuration parameters. This nano quadcopter drone weighs only 27 grams but supports up to 42 grams of weight at takeoff. Four independently controlled coreless DC motors allow the Crazyflie to float through the air gracefully. A 10 DOF Degree Of Freedom IMU Inertial Measurement Unit provides a full suite of navigational sensors. The first nine DOF are implemented using triple axis accelerometer, gyroscope and magnetometer sensors. The tenth DOF is a high precision pressure sensor. An expansion port is provided to add own sensors and hardware. The Crazyflie 2.0 comes preprogrammed so that it can be used without any development effort at all. After a simple assembly process, anyone can fly this palm sized drone via a BLE compatible Android or iPhone app. Advanced users will enjoy the power of programming with a variety of clients available on GitHub including Python, Ruby, C#, C/C++, Java and more! The embedded STM32F405 is also fully programmable. It's a fully open source drone platform. 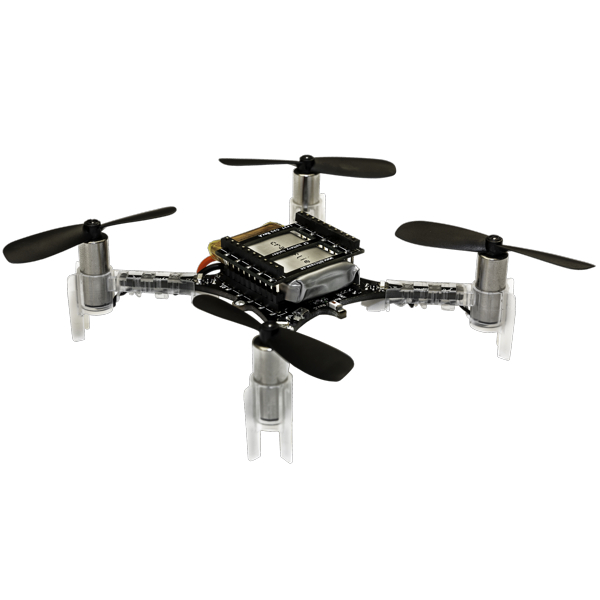 The quadcopter kit is easy to assemble and doesn't require any soldering. The assembled kit measures 92x92x29mm and weighs 27g and can handle an additional payload of up to 15g. The Crazyfile requires a choice of radio clients for operation. A BLE compatible Android or iPhone is required for operating via a smartphone app. It can also be operated wirelessly from a PC based client using the Crazyradio PA Long Range 2.4GHz USB Radio which is sold separately. 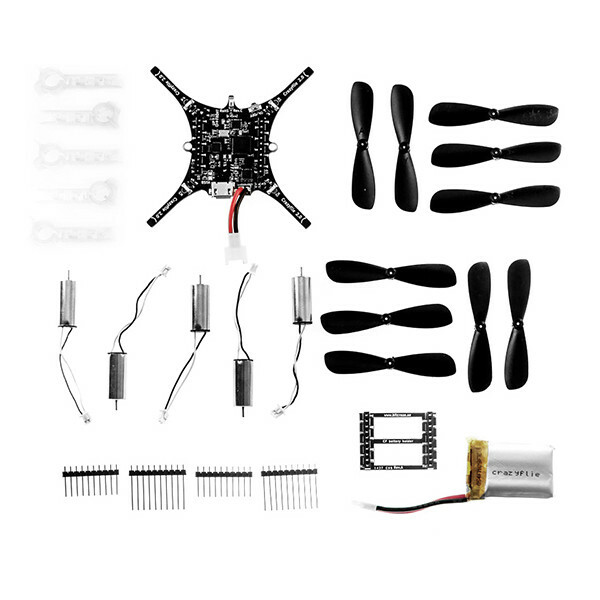 The Crazyflie 2.0 package includes a control board, five coreless DC motors with mounts, five CW and CCW propellers, a 240mAh LiPo battery with holder and a set of optional expansion connectors. An optional Crazyradio PA radio is sold separately.